Harry Warner? Sam Warner? Jack L. Warner? D. W. Griffith? Apocryphal? Can you find a solid citation for this remark? 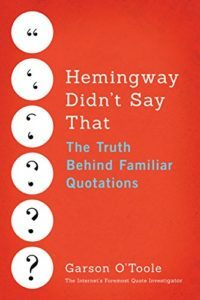 Quote Investigator: The earliest match found by QI appeared in the 1965 autobiography of Jack L. Warner who recounted a contentious episode between his two brothers Harry and Sam. In the 1920s Bell Laboratories had developed a new system that enabled the coupling of film with high-quality synchronized sound, but Harry Warner was uninterested because previous technical attempts to combine sound with movies had resulted in commercial debacles. “But don’t forget you can have actors talk too,” Sam broke in. Harry was excited by the breakthrough because theater owners would be able to save money by forgoing live musical accompaniment. Yet, he did not perceive the primal importance of the expressive human voice to the future of film. This anecdote from Jack was published decades after the event occurred. Also, Jack was not present; hence, the quotation must have been relayed to him from Sam, Harry, or another participant. Continue reading Who the Hell Wants to Hear Actors Talk?